A second airplane carrying the bodies of people killed in the Russian Airbus A321 crash in Egypt landed at the Pulkovo airport near St. Petersburg at around 4:16 a.m. on Nov. 3, an Interfax correspondent has reported. A source in the operation headquarters told journalists that the airplane had delivered the remains and personal belongings of some of those killed in the air crash. 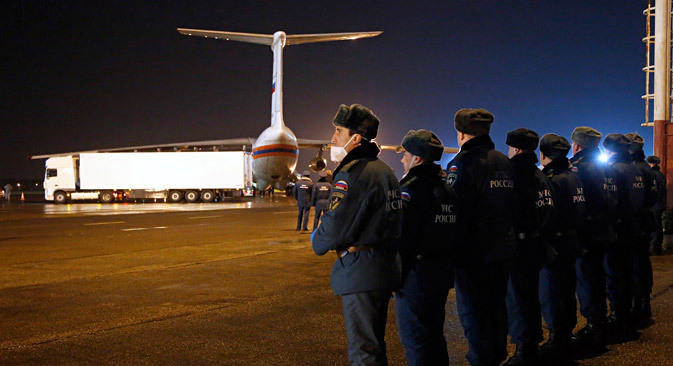 The first airplane of the Russian Emergency Situations Ministry with the victims' bodies on board arrived in St. Petersburg early on November 2. Russian Investigative Committee spokesman Vladimir Markin said that the plane had delivered the bodies of more than 130 people and over 40 body parts. More than 100 rescuers of the Russian Emergency Situations Ministry continue working at the air accident site in the Sinai peninsula. They have examined an area of more than 15 square kilometers and have found body parts of those killed in the Airbus A321 crash, personal belongings and 118 passports, including those belonging to four Ukrainians and one citizen of Belarus. The Kogalymavia air carrier's Airbus A321 passenger jet, en route from Egypt's Red Sea resort of Sharm el-Sheikh to St. Petersburg, crashed in the mountainous al-Hasanah area of central Sinai on October 31, killing all people on board, among them 217 passengers and seven crewmembers.